Thursday, Oct. 31 from 6 to 9 p.m.
What are you doing after trick-or-treating this year? 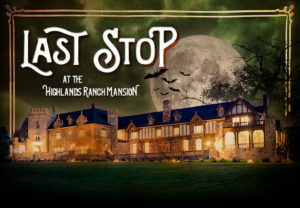 End your Halloween night at the Mansion and Historic Park. Ghouls and goblins of all ages are invited. This is a free outdoors-only event, and the interior of the Mansion will be closed. Some visitors just make a quick stop to trick or treat at the front door, while others might stay for a cocktail on the veranda. We’ll have a DJ playing Halloween music and a cash bar with drinks for purchase, including a signature spooky cocktail. Please note: Parking is limited, and parking in the surrounding neighborhoods is not allowed. We strongly recommend carpooling and encourage residents in the area to bike or walk. Please call us with any questions at 303-791-0177. The Highlands Ranch Mansion is a Highlands Ranch Metro District property.